Andhra Pradesh Teachers Eligibility Test 2019 Notification is on at its Official Website. Online Application may submit from ......... Aspirants are getting ready for the qualifying examination which is first AP TET after separation of Telangana in 2014. 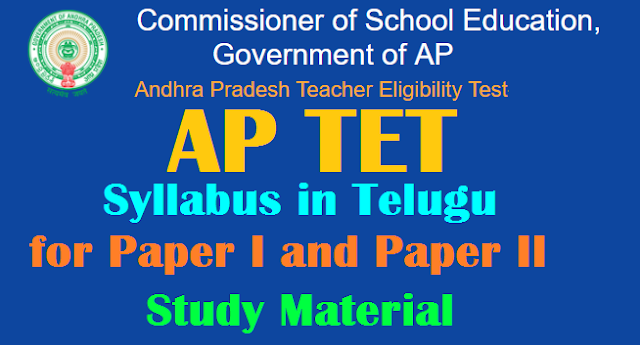 The candidates who are going to attempt AP TET 2017 for Paper I and Paper II they have to go through the Syllabus and have to understand it to collect proper Study Material. If Good Plan of action is there its not a stuff thing to qualify in the key examination of Teachers Recruitment in Andhra Pradesh. For the AP TET which is also called as Gateway of AP DSC. We are ready to help the aspirants on their of achieving goal. Hence we are providing here AP TET 2018 Syllabus in Telugu to understand it better.